Enjoy our Park City condo across the street from world famous Park City Mountain Resort. Our condo is a one bedroom with a loft. There are 2 full bathrooms. The kitchen has been fully remodeled. The bedroom has a queen bed. The loft has a queen bed & a twin bed. The sofa in the living room folds out to a double bed. There is a wood burning fireplace, cable TV, DVD, VCR & stereo. The patio has a great view of Park City Mountain Resort. The Snowcrest Condos are located at 1530 Empire Ave. Just off the shuttle line. There is a year round outdoor pool that is heated nicely in the winter. There is a spacious shared hot tub as well. There is plenty of parking in the Snowcrest lot. Our condo is located on the 3rd floor & unfortunately there is no elevator. High-speed internet / Wi-Fi in condo. We hope you love our condo as much as we do. You can't beat the location to the lifts & only one mile from Main Street. Condo was close to lift and had everything we needed. Thanks for letting us stay- we had a great time. This is the best location of anywhere we have stayed in Park City. 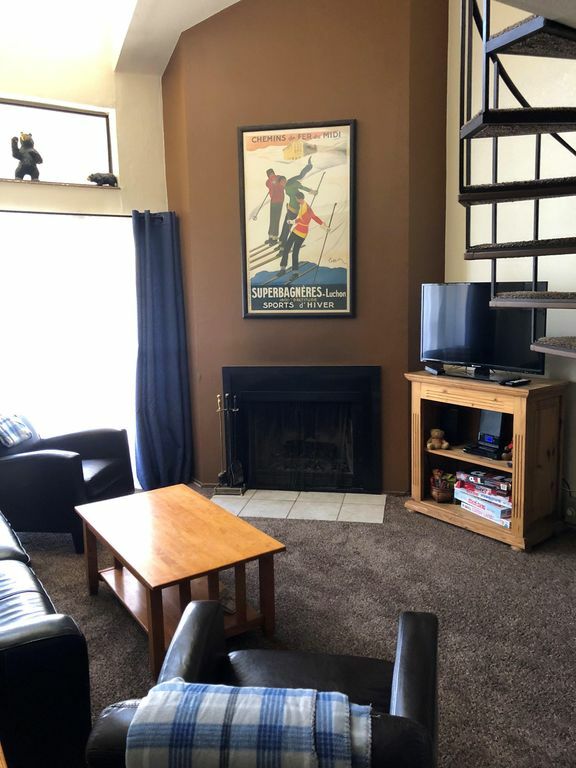 Very close to the lifts, easy walk to the grocery store, and bus stop right across the street. Everything was well maintained. I would definitely stay here again. We have stayed here twice now, and loved it both times. Great location near lifts, grocery, ski shops and more. Quiet building and the hot tub and pool were nice after a day on the slopes. Condo is clean, well stocked with kitchen utensils and good appliances. Evenings by the fire (drying out some gloves after snowy days on the slopes) were enjoyable. Kristian's condo has all the amenities we were looking for and needed. The living room and dining room were well-furnished. The beds were comfortable. The kitchen was well stocked with cooking and dining needs. The condo complex had a good sized hot tub and pool. We love this condo's proximity to the base of PCMR, and to the bus stop. We will definitely choose to stay here again. We had a great time. The location perfect. The size was perfect for 5 people. I could not have ask for a better place to stay. - Great Location - walking distance to the slopes. On the Bus Route. - Awesome condo - Lots of space. Besides the downstairs 1 bedroom and bathroom, there is a huge upstairs loft with 2 beds and a private bathroom. - Great owner - Kristen was very responsive to our questions. I highly recommend this property. Contact me via message the owner if you would like to rent directly with me and minimize transaction costs. If booking with me directly, only first 2 days are due at time of booking with remaining due 2 weeks prior to check in.